>> What Type of Weather Does a Warm Front Cause? Warm fronts are defined as the transition zones where warm air replaces a huge mass of cold air. The warm air fronts are generally known to move from the southwestern direction to the northeastern direction. Air that follows a warm front is much more hot in comparison to the air that is in front of it. When warm fronts pass through a particular area, they make the air warm in comparison to what it was. The climatic conditions also tend to become very humid. 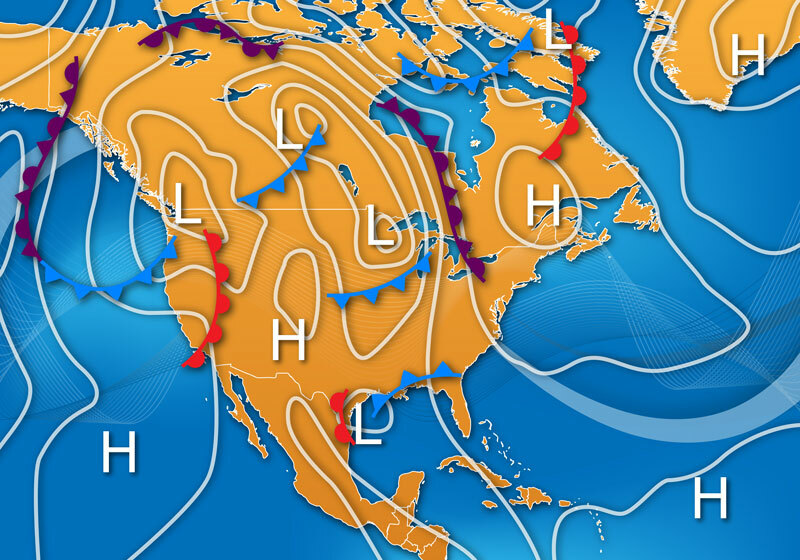 In the weather maps, the warm fronts are represented by semicircles. The temperature change can be noticed in no time. 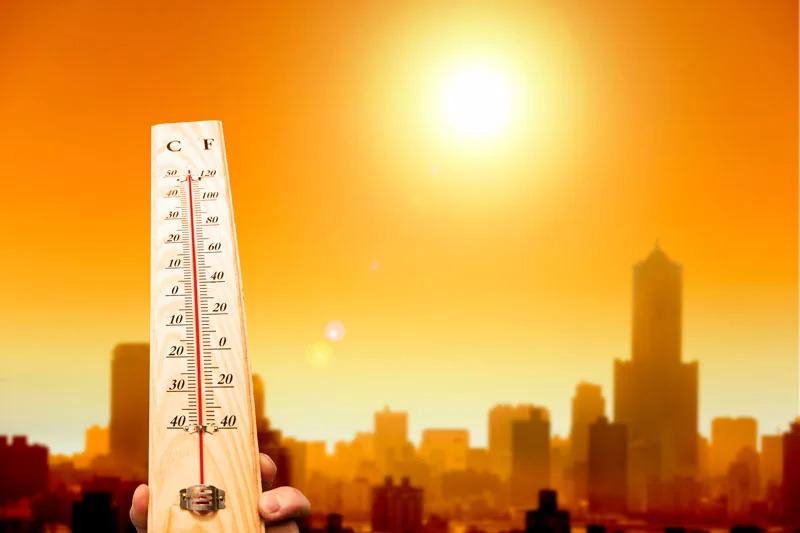 Studies revealed that the temperature in front of the warm front was 53° Fahrenheit and behind the warm front, the temperature was around 71°F. If you see that there is a sudden increase in the temperature, you can understand that a warm front is going to approach soon. Fronts are known to represent the different boundaries that are present between the colliding masses of air. The warm fronts form in low-pressure areas. Here, southerly winds are known to push the warm air towards the North. After this, the warm fronts move from the southwest towards the northeast direction. Warm fronts are responsible for huge weather changes. Before a warm front arrives, the pressure starts decreasing. It brings rain, snow, or sleet along with it. The types of clouds that appear during a warm front include Nimbus, cumulus, and stratus clouds. There is also an increase in the dew point. Weather fronts are responsible for the clouds as well as the precipitation. But the characteristics are highly dependent on the two types of the front. Weather forecasters will definitely warn you beforehand. If you can understand the weather difference that a warm front can cause, you will be able to predict the weather without any hassle. When a warm front approaches, you have to break out of the rain gear and the umbrella. As soon as the warm air starts advancing, the cold air starts sloping gently like a ramp. This ramp is responsible for uplifting the huge areas of air that is not only warm but also has a less density. The slopes of the typical warm fronts are 1:200 when compared with a slope of a cold front, which is 1:100. This is the core cause as to why the warm fronts are responsible for a larger cloud cover along with heavy precipitation. Since the warm air that advances is not as dense, it cannot push back the heavy cold air within a short period of time. This is the reason as to why the warm fronts do not move as fast in comparison to the cold fronts. The clouds cover a huge area, and the precipitation is capable of extending over large miles before the advancement of the warm front, as well as when it passes away. The first thing that you will observe when a warm front is about to approach is the wispy and high cirrus clouds. As it starts nearing, the layer of clouds will start thickening along with a drop in the base. This sequence consists of the cirrostratus clouds, which are followed by the nimbostratus, stratus, and the altostratus clouds. The precipitation that is normally associated with the warm fronts is light and steady, and the intensity can be moderate. These fronts have a slow speed, and the rain is capable of lasting for several days. The warm fronts are additionally responsible for the thunderstorms as well as intense precipitation. Warm fronts are not like the cold fronts, and they are extremely variable and light. Warm fronts normally involve the centers of low pressure, and hence the barometric pressure will start falling. This allows the weather forecasters to detect that a warm front is approaching. The pressure starts stabilizing before rising again. The warm fronts are also characterized by poor visibility because of a layer of clouds as well as precipitation. To conclude, both the warm fronts and cold fronts have various characteristics that can influence the weather in a completely different manner. So, it is better to keep your eyes and ears open.